EPAT Treatment - Shockwave Therapy | Podiatry Associates, P.C. Stubborn Foot or Heel Pain That Won’t Go Away? Say Hello to EPAT. At Podiatry Associates, we treat people everyday who are experiencing mild to severe foot and heel pain. This foot and heel pain is typically caused by a condition called plantar fasciitis, but can also include Achilles Tendonitis, Heel Spurs, Tendon pain, and Neuromas. Besides our normal course of treatment, we now have a new technology in our practice – Extracorporeal Pulse Activation Technology (EPAT). Some people may refer to this as “shockwave” but it is really a vibratory type of feel. Extracorporeal Pulse Activation Technology (EPAT) is the most advanced and highly effective non-invasive treatment method cleared by the FDA. This proprietary technology is based on a unique set of pressure waves that stimulate the metabolism, enhance blood circulation, and accelerate the healing process. Damaged tissue gradually regenerates and eventually heals. 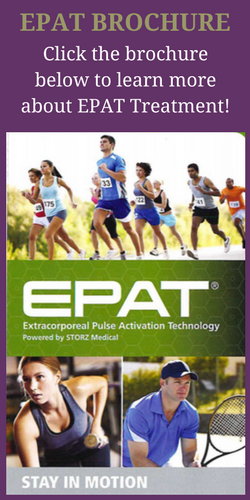 The beneficial effects of EPAT are often experienced after only 3 treatments. Some patients report immediate pain relief after the treatment, although it can take up to 4 weeks for pain relief to begin. The procedure eliminates pain and restores full mobility, thus improving your quality of life. Over 80% of patients treated report to be pain free and/or have significant pain reduction. Coupling gel is applied to the specified treatment area to enhance effectiveness. After these preparations, EPAT pressure waves are released via the applicator which is moved over the area in a circular motion. EPAT has a proven success rate that is equal to or greater than that of traditional treatment methods (including surgery) and without the risks, complications, and lengthy recovery time. EPAT is performed in Podiatry Associates clinics, does not require anesthesia, requires a minimum amount of time, patients can immediately weight bear, and patients can return to normal activity within a few days of the procedure. Insurance typically doesn’t cover the EPAT procedure, however the elective payment options allows you to have the benefit of the EPAT procedure at a very reasonable price. This non-invasive option will be particularly appealing to those patients who are eager to return to work or normal activities in only a few days with very good clinical results. Your Podiatry Associates podiatrist can provide more information and pricing programs when you come in to visit at one of our four offices at Parker, Castle Pines, Cherry Creek, and Aurora. Call to schedule an appointment at 303-805-5156. Click here to learn more about EPAT Treatment and how it works.